Actually, people aren’t sure of the exact date the great poet and playwright, William Shakespeare, was born, but his birthday is celebrated on or near April 23rd, which is today! We do know the year he was born — 1654. That was 450 years ago. Yes, FOUR HUNDRED AND FIFTY! So this year the celebrations for his birthday are extra-special. I just hope they don’t try to light 450 candles all at once! William Shakespeare was born in England, in Stratford-upon-Avon. (That means Stratford is beside the river Avon, it isn’t really right on top of it!) He likely attended the grammar school near his home. (That term doesn’t mean they only learned grammar, that’s what elementary schools are called in England.) They learned a lot of Latin, and read a lot of Latin, but he obviously learned English very well, too. 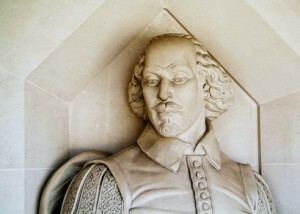 This link to Shakespeare Online tells about what his schooling would have been like. Not only did he learn the English language well enough to produce some of the best writing ever, but he was inventive in his use of the language also. In fact, many words that we take for granted these days are words that Shakespeare made up. I can just imagine him sitting at his desk, parchment paper in front of him, his quill pen in his hand, trying to think of just the right word… then shrugging and making one up. We owe words such as dawn, zany, gloomy, and elbow to Shakespeare — and if it weren’t for him, we wouldn’t have luggage with a label! Here’s a link to more of the words he coined or joined for the first time. Shakespeare wrote 37 (or more) plays — the number is uncertain. Although most of them are intended for an adult audience, when I was in seventh grade we acted out part of A Midsummer Night’s Dream in our Literature class. There are also modern plays, even musicals, that are based on Shakespeare’s plays. For example, West Side Story is a retelling of Romeo and Juliet, and Kiss Me, Kate is the story of a troupe of actors putting on The Taming of the Shrew. We definitely have a lot to celebrate on Shakespeare’s birthday — and a lot of people will be celebrating along with us. The people in Stratford-upon-Avon, where he was born, are definitely celebrating. Among other things, the Shakespeare’s Birthday website says “There’ll be music, street entertainers, story telling, acting, stage combat and theatre make-up activities, tours of the Shakespeare houses, children’s parties, sonnet readings…” It sounds as though it will be a lot of fun! Here’s the link so you can read all about it. We’re a little late for the festivities at Shakespeare’s Globe in London, a theatre that has been built to replicate the Globe Theatre that Shakespeare started. On Monday, April 21st, they had a free Family Open Day. “Pin the Ruff on the Bard,” anyone? Next time I’m in London, I’m definitely going to go to Shakespeare’s Globe. There are tours that explain just how plays were put on in Shakespeare’s time — there were no women actresses, for one thing. Boys played all the female parts. And there was no backstage area as we know it. The Discovery Space on the website will give you a good feel for what the theatre is like, and what theatre was like in Shakespeare’s time. In part of that Discovery Space you can experience what it would be like to be in one of the plays, such as A Midsummer Night’s Dream. Also on the website there’s a cool “playground” for kids. Check it out! Shakespeare is definitely awesome, as are these celebrations! Thanks, Erik!